The IVVA was contacted by a journalist from the Irish Independent yesterday. We were asked for a comment regarding the announcement of the new ASAI code of advertising, which we wrote about here. Our short statement of comment was sent, the resulting piece has now been published, and the IVVA would like to address a few points raised in it. On a point of logic, vaping products should be attractive and appeal to smokers. After all, isn’t that the point of all advertising, to attract your target customer to buy your product? Smokers are the target market for vaping products, and if a smoker chooses to purchase an e-cigarette instead of their usual pack of tobacco cigarettes, is that not the intended positive outcome? We have an extensive and growing body of evidence to illustrate just how safer e-cigarettes are compared to tobacco smoking, so why would more smokers being attracted enough by an ad to switch to their use be a bad thing? By presenting smokers with bland and clinical advertising, the chances of a smoker being attracted enough to try an e-cigarette may be diminished. They may be missing out on a chance to switch to a product that’s 95% less harmful than their usual tobacco cigarette. The piece then quotes Fine Gael Senator Catherine Noone, who refers to a study from the US that was published at the beginning of last week. The report, published this month in the health journal ‘Pediatrics’, found that one in five American students are using e-cigarettes to inhale cannabis in a vaporised form. Any study which classifies someone who tries a product, without properly quantifying that rate of use, is not, unfortunately, a very ”useful” piece of research. In effect, what it means is, if someone takes so much as one puff of their parent’s e-cig or is given one to try by a peer, they would be classified, under the flawed protocol of this study – a ”lifelong user”. So what of this study’s finding on marijuana use? How did they classify those students? That still doesn’t bring us to the figure of one in 5 American students using e-cigarettes to inhale cannabis, though. At this juncture they were not asked how they had used cannabis, just if. 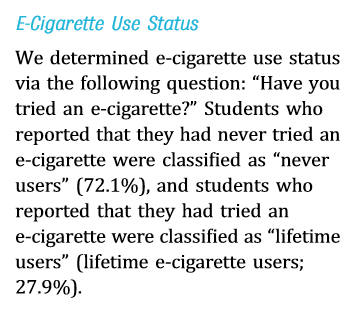 However, if you look at the above paragraph again you’ll see that if one of these students were to have so much as sneaked a puff of their parent’s e-cigarette in January, and then took so much as a puff of a marijuana cigarette in June – using this flawed methodology isn’t it the case they would have been counted as a ”lifetime dual user”? 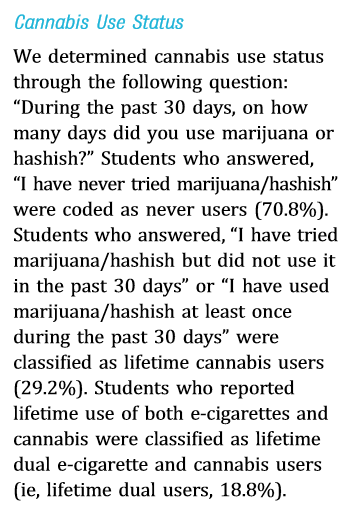 Finally, there are the questions within the study that pertain to how these student were using cannabis. But here’s the interesting thing – the most popular response? So, what of that number of one in five students using e-cigarettes to inhale vapourized cannabis? Well the total number of those students solely using e-cigarettes to vapourise cannabis oil was a mere 5.4% of the total sample of 3,847. And when you take into account the fact that that number includes those who may have only used either an e-cigarette or cannabis once, this extrapolated figure of one in 5 is looking less credible. 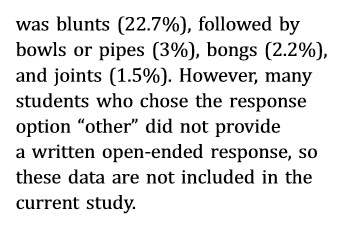 But a really interesting figure in the study data is this – 9.7% of the total sample of 3,847 were using dry herb or wax vapourizers – ie – not e-cigarettes at all. These are very different products to the electronic cigarette products that vapourize e-liquids, used by smokers and vapers. They are not interchangeable for both purposes. And they were invented and in use long before e-cigarettes came into use. 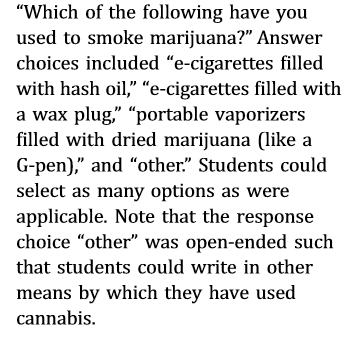 But regardless of the fact that such a small subset of these 5 high schools in Connecticut were using these products – MORE of them were actually using vapourizers specifically designed for the use of cannabis, than were using e-cigarettes – a harm reduction tool for smokers. They still ”shouldn’t” have been using them, and likewise, under 18’s ”shouldn’t” be getting their hands on e-cigarette products either. Which brings us to our next point, and that’s one of access to products intended for adults by under 18’s. The IVVA made a submission at the beginning of this year in response to the government’s proposed change in tobacco licensing legislation. In that, we fully supported the proposed restriction of the sale of vaping products to, and by those under 18. It is something that has been in our member code of conduct since the association started. Our members have also taken the collective decision to not stock dry herb or wax vapourizers in their stores, and that too is written into our code of conduct. No responsible vendor of e-cigarette products intended for adult smokers and vapers is going to sell them to under 18’s, and once the new legislation is enacted, this will make it a legal offense to do so. There’s a wider, perhaps more abstract issue that also needs to be addressed here, and that is one of using gateway arguments and children while issuing warnings and concerns over a product that helps adults cut down their harms from smoking tobacco. Gateway claims and youth use are being studied at the moment in the US and the UK, and both of those sets of data are showing us that there is no basis for the gateway hypothesis. It’s a topic we will cover in more detail on this site in the coming weeks. Children should not be used as ‘policy hostages’ by campaigners and used to hold adults to ransom by denying them products and pathways that would help them. We should create the right adult society and kids will initiate themselves into that. It shouldn’t work the other way around. Almost any adult behaviour can be challenged by reference to ‘think of the children…’ arguments with unfalsifiable conjectures about what might go wrong.